We are as dedicated to the needs of the patients as we are to the needs of the clients we represent. Mediclaims, Inc, is a billing service dedicated exclusively in Emergency Medical Services billing and reimbursement for 21 years. Currently, we provide this service for many clients nationwide. Mediclaims now represents EMS providers including municipal, county, fire, police and volunteer services. Because of the diversity of our client base in regards to size and locations, it is mandatory that we remain abreast of all regulations, whether national or particular to the area, which may affect our clients, such as the new Medicare Ambulance Fee Schedule, Medicare Compliance and HIPAA. In an effort to keep our clients informed, Mediclaims, Inc. conducts on- site in-services for the medics, which have proven to increase collections through better documentation. Mediclaims, Inc. also provides extensive consultations regarding not only documentation, but coding, Medicare/Medicaid regulations, membership/subscribership consultations and budgeting and statistical information. Mediclaims, Inc. is proud of the staff, which is composed of personnel with a wide range of both medical and accounting experience, including, LPN, EMT,CNA,CMA, AAPC certified coders, BS and BA in accounting. The organization also includes several Client Service Representatives to assist with data entry, filing, gathering information, and assisting your patients when they call. 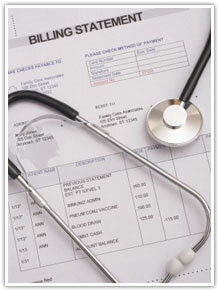 Mediclaims, Inc. uses the top of the line physicians billing software Medical Manager. An essential feature of this software is the ability to provide financial reports useful to management for realistic budgeting and auditing purposes. Our reports provide information relative to the financial activity and productivity of the service, which equates to our clients being better informed and in control of their finances than ever before. Mediclaims, Inc. is as dedicated to the needs of the patients as we are to the needs of the clients we represent. We work to obtain the proper and appropriate documentation, physicians statements, hospital admit/discharge summaries, patient signatures, accident reports, proof of medical necessity statements, medical reviews, completion of worker’s compensation forms (or any other insurance forms necessary), filing liens, and follow up and resubmit any denials. If the patient has a problem, we work directly with them for a resolution. Mediclaims' professional association memberships and affiliations include: the American Ambulance Association, the International Fire Chief’s Association, the American Business Women’s Association, and the Tonkawa Area Chamber of Commerce.